Habit: deciduous shrub growing with arching stems and in a spreading fashion. The bark in older shrubs is brownish and peels away from trunks. The green leaves are pyramid to egg shaped with many small lobes on the margins each ending in a sharp tip. 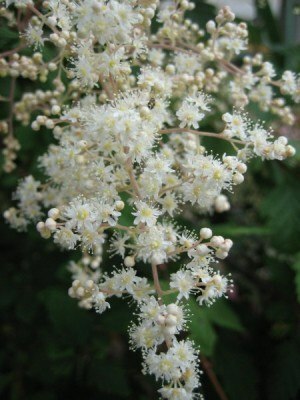 The drooping 4-8 in (8-20 cm) lilac-like cluster is composed of multitudes of tiny creamy white flowers giving off a pleasant fragrance from a distance. 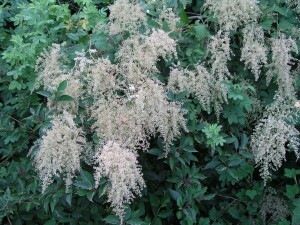 The flowers turn to beige then brown and often persist through winter. The dry, one-seeded fruit is small and hairy. 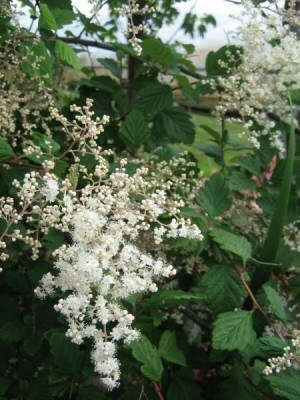 Blooming takes place between May and July. Leaves turn red in fall. 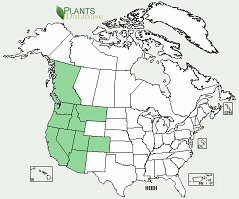 Ecology: native to Western North America at elevations under 5900 ft (1800 m) in dry to moist habitats such as upland open woods, canyon bottoms, and stream banks, also found in disturbed areas especially where fire has been. Growing Conditions: full sun to partial shade, moist to dry well drained soil. Drought tolerant species. 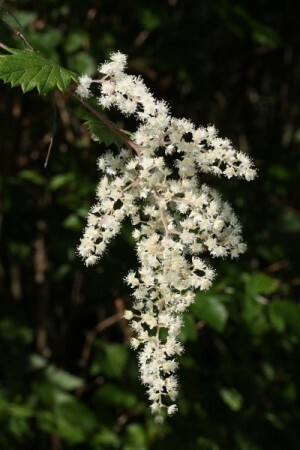 Oceanspray provides cover for numerous birds and small mammals, also tree frogs. Birds and squirrels eat the seeds that persist into winter. Oceanspray grows rapidly, and has a short life span. It can be useful for low maintenance riparian plantings, reclamation of dry, rocky or disturbed sites, and windbreak.